Do you have an account with Syndicate Bank? Do you visit the branch or the ATM for checking the available balance in your account? Online banking service is widely popular across the country for its convenient services. The leading banks including Syndicate Bank introduced the latest digital banking facilities and missed call services. The missed call balance enquiry number is one of the advanced services introduced by the bank for ensuring the convenience of the account holders. The account holders check the available balance in their account by passbook printing, using the debit/ATM card or accessing internet banking services. The traditional methods of checking the account balance are time-consuming and require effort. The options also have a few restrictions. But, the account holders can check the available balance in their account by dialling the syndicate bank balance enquiry toll-free number. Before using this service, you have to register your mobile number for Syndicate Missed Call Banking. You will get confirmation on your mobile number. After successful registration, you have to follow below steps to take advantage of miss call facility. 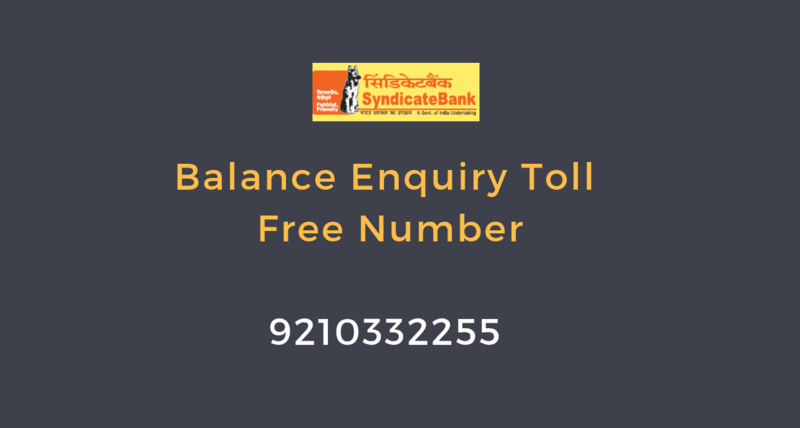 9210332255 is the toll-free number introduced by Syndicate Bank for balance enquiry. Dial the balance enquiry number from your registered mobile number. Give a missed call or the call will get disconnected automatically after 2-3 rings. Within a few minutes, you will receive SMS from the bank featuring the available balance in your account. You can dial the missed call balance enquiry number any time and from anywhere. You don't need to pay to the bank or the network service provider as it is a toll-free number. Accessing the missed call service is simple and easy. You can save time and effort in the process of obtaining the details about the available account balance.